A recent Wall Street Journal special report on health care included a revealing article titled “Where Are the Mental-Health Providers?” Reporter Louise Radnofsky presents convincing evidence and sounds the alarm about the increasing difficulty of finding much-needed mental health care in many regions of the United States. Radnofsky quotes statistics from a recent study by Mental Health America, a patient advocacy group. The study found that while 42.5 million adults in the United States have a mental illness (18% of the population), the ratio of mental health providers to people in the US is just 1:790, while only 41% of people with a mental illness report receiving treatment. It’s about time. In this month’s article and book excerpt, I explain my thinking on the Dr. Jekyll and Mr. Hyde nature of trauma treatment by psychiatrist-prescribed medications. I will stress again that there is an important role for psychotropic drugs in effective therapy. But—too often—drugs are presented as the complete answer for trauma sufferers. Nothing could be further from the truth. Chemically locking away traumatic memories may help people temporarily, as I’ve outlined above. But I firmly believe that the hope for healing lies in unearthing and resolving the painful past. Drugs can make this process all but impossible when patients have great difficulty accessing their memories. And, over time, serious and life-compromising side effects of medication pile up. Well-trained psychotherapists play a vital role in our nation’s mental health. I’m all in favor of greater recognition of this serious gap in our mental health system. On Monday, August, 11th, Robin Williams took his own life. Robin was a brilliant, gifted actor and comic who struggled with addictions to alcohol and cocaine. He admitted to experiencing episodes of depression and displayed manic tendencies in his work. Personal experiences of trauma, I believe, left their mark on his life in recognizable patterns. His death is a tragic loss for his family and fans. After the suicide of a friend or loved one, people often ask themselves if there were signs that they missed of the individual’s intent to suicide. In some cases, the troubled individual does exhibit warning signs, which can be subtle or obvious. In the following excerpt from my book, I provide guidance and suggestions for finding and recognizing signs of potential suicide. “First, be observant when dealing with a traumatized individual. Loved ones of suicide victims often recognize too late that there were warning signs. Understand the possible warning signs of suicidal behavior. If you suspect a person may be contemplating suicide, trust your judgment. “Suicidal behavior results from many different traumatic experiences, from sexual abuse to a disabling accident to the death of a loved one. It can also be caused by seemingly less serious life situations that are uncontrollable, such as a successful professional’s job loss or an exemplary student’s experience of poor grades. As this book illustrates, almost anything can lead to trauma if the event is unexpected and the person has a negative reaction to the experience, particularly if she has suffered developmental trauma in childhood. “Pay special attention to any individual with a previous history of suicidal behavior or suicide attempts. And certainly, take action if someone close to you begins talking about suicide or shares plans of suicide. At this stage, professional help is absolutely necessary and should be sought as soon as possible. If you feel your loved one is at a very high risk of suicide, don’t leave him alone; call help to the scene. “Drastically elevated moods after a long period of deep depression can also be a warning sign that a suicide attempt is imminent. Once a person has resolved to commit suicide, he or she may exhibit behaviors that seem almost euphoric. The shift is usually sudden and without any change in life circumstances. The change can distract loved ones and friends from the victim’s condition, giving them hope that things are turning around. In fact, such a dramatic change in behavior is a smokescreen for the increasingly dark feelings and can be a sign that a suicide attempt is just days or even hours away. “Many family members of suicide victims wish their loved one had shared their despair and plans with them. If so, they feel they could have stopped it. But most people contemplating suicide keep their plans to themselves. Therefore, it’s up to those around them to stay in tune with their behaviors. If you are suspicious, ask the other people in your circle what they have noticed. “Even if you aren’t convinced that your loved one is contemplating suicide, reach out to her and show you care. Be open to hearing what she has to say, but also tell her what you have noticed in her behavior, referencing specific actions and incidents. Then, ask direct questions about her current state. Don’t be afraid to say the word suicide. Talk to her about her plans, previous attempts, and thoughts about suicide, if applicable. Listen, talk openly, and let her talk. Try to be understanding and open-minded about her thought process and feelings. This is the time to determine her risk for suicide. “Most important, try not to become upset or over-emotional during these conversations. Becoming upset might discourage at-risk people from talking to you again about their situation, and you want to keep an open dialogue so you can continue to monitor them. By mitigating your reaction in this way, you pause your own feelings and emotions about the situation in the moment. Remember, you must deal with these emotions at some point, allowing yourself to experience your feelings when it’s more appropriate. Ignoring your feelings indefinitely or overriding them for an extended period will only do you harm, and you will likely become a secondary trauma victim. “Finally, offer hope and solutions to those at risk. Discuss the option of seeking professional help to deal with their pain. If they are resistant, help them imagine what life could be like without pain and despair. Let them know that such a life is possible for them with the right help and support, including that of friends and family, and counselors and therapists. Resolve to find help for your at-risk loved ones even if they are resistant. Be firm and diligent about your intentions to get help for them, even if they refuse to get it for themselves. When the danger signals are present, don’t wait for confirmation of their plans to seek professional help; move forward on your own if at all possible. (See chapter 6, “Seeking Treatment.”) They might ask you to keep your conversation secret. Don’t. Secrets can be deadly. Today I want to introduce the concept of traumatic reenactment. Reenactment is a process that includes compulsively repeated thoughts, attitudes, and patterns of behavior. 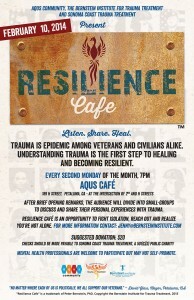 The goal of reenactment is to resolve and heal a past traumatic experience or series of experiences. Reenactment arises out of our past and can seriously disrupt our present lives and relationships. “Children who were abandoned by a parent or who went through the divorce of their parents may also reenact this experience in future relationships. They will often set themselves up to be abandoned or abused by seeking out friendships and romantic attachments in which they are destined to be left, discarded, or rejected. “Men will become attached to women who are certain to leave them, or they will adopt behaviors that drive women away. Women will form attractions to men who are unattainable, abusive, or noncommittal. They approach life with the mentality that they are always doomed to be abandoned and create real-life situations in which that belief is validated. “Another patient, Lucy, for example, grew up in a home in which her father left her mother for another woman when she was a little girl. Her parents divorced, and Lucy was raised by her mother who did her best as a single parent. When Lucy was old enough to date, she developed a pattern of pursuing boys who weren’t really interested in dating her. She would manage to persuade them to date her for a while until they finally, inevitably, broke up with her. She would be devastated every time. “As an adult pursuing more serious relationships, Lucy continues to be involved with men who don’t value her, who cheat on her, and who eventually leave her. She doesn’t understand why her dating life is this way. Lucy attributes it to the immorality of men and to her worth as a woman. The truth is that there are plenty of men in the world who could love and cherish Lucy, but she is blind to these individuals because of her experience with her father. He was supposed to love and cherish her, but instead, he left her behind. Lucy doesn’t know how to build a healthy relationship with a man. She only knows how to experience the pain of her father’s leaving over and over again. Newspapers and media outlets are carrying daily revelations of serious shortcomings in the Veterans Affairs healthcare system. Those who have served our country, with honor and sacrifice, are receiving far less than their due for their medical and psychological needs. In 2010 and 2011, I provided resilience training to VA combat crisis treatment teams in the VISN 3 network—case managers, nurses, social workers, psychologists, suicide prevention coordinators, and other staff in eighteen medical facilities in the New York and New Jersey area. My firsthand experience with the VA system during this year-long contract, combined with experiences of my patients and friends, matches and confirms much of the recent reporting. Unfortunately, I’m not surprised at the level of bureaucratic dysfunction in our Department of Veterans Affairs. Bureaucracy can have its own brand of trauma. Certainly, the VA treatment teams I worked with named “the bureaucracy” as their number one source of trauma on the job. Considering that these health professionals served a high-needs, often highly-traumatized population of Iraq and Afghanistan war veterans, this was a disturbing finding. Bureaucracies, by nature, are hierarchies. Each level of the hierarchy possesses a level of power and authority over those levels below it. These positions of authority are proscribed, and by that I mean that the authority belongs by definition to the job position, not the person. The organizational chart dictates who has power and control over whom. When people who are natural authorities—skilled, mature, capable leaders in their fields—are also those with the proscribed authority, all can go well in a bureaucracy. When less-qualified professionals take positions of control, mistakes and abuse can follow. Poor leaders with proscribed authority can be capable of cutting corners ethically, making unreasonable or impossible demands on front-line staff, and creating both dangerous and even toxic work cultures and deficiencies in delivery of services. This is what we’re seeing now at the VA. My heart breaks to witness it. Corruption has crept into a system that some of our finest men and women depend upon for their very health and well-being. While working with the VISN 3 treatment teams, I found many highly dedicated, skilled, and compassionate professionals providing care to the best of their abilities, within some significant constraints of time and resources. As caregivers, they worked long hours, often donating their personal time to meet the needs of veterans and their extended families in ways the VA system couldn’t or wouldn’t provide. Pressure from above to meet quotas and keep up with voluminous paperwork were actual sources of trauma for them. While some already knew effective self-care techniques to stay resilient, too many of them were also close to burning out. Losing effectiveness of the job and watching their home life deteriorate was the last thing these health professionals wanted to have happen to them. They wanted to continue serving in a calling they loved and were committed to. I think of them now—how hard they worked and how much they cared—and hope that real reform in the vast bureaucracy of our Veterans Affairs will happen soon. Veterans, and their caregivers, deserve better. 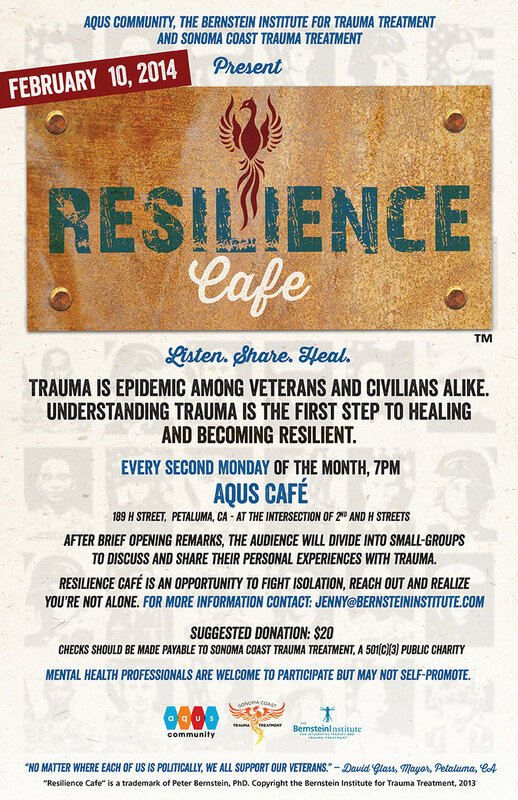 The next meeting of Resilience Café will be held on Monday, February 10th at Aqus Café from 7:00 to 9:00 PM. Please join us for this continuing public forum for the discussion and healing of trauma. We offer all who attend the opportunity to “Listen, Share, Heal,” as together we fight the stigma often associated with mental health challenges and the isolation trauma sufferers experience from our “hidden epidemic”. My message – then and now – is one of hope. With help and hard work, trauma can be resolved and transformed to restore meaning and purpose to our lives. Aqus Café is located at 189 H Street, Petaluma.